Do you have a little builder in your life? If your little one loves working with their hands, I’ll bet you’re on the hunt for the best workbenches for kids. You may not even realize it yet, but this will help develop so many of your child’s skills. 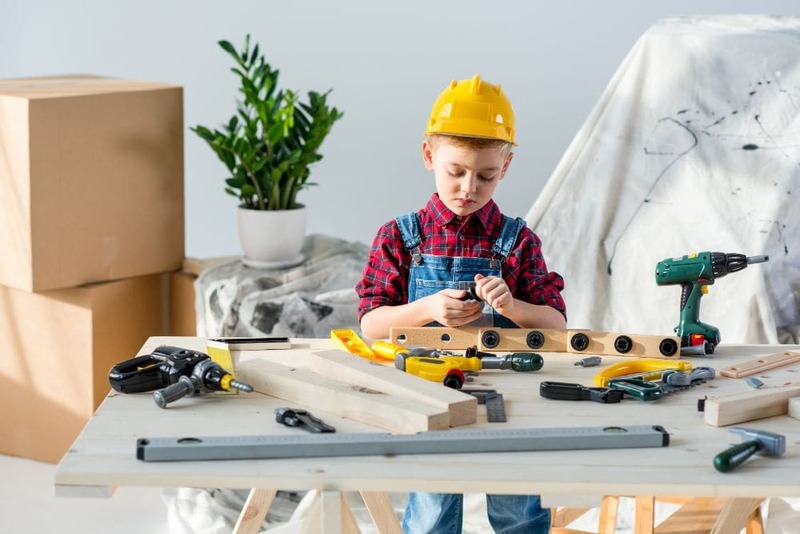 Just like play kitchens, kids’ workbenches are among the most beneficial toys for several aspects of growth and development. There are plenty of options to choose from and we’re going to review some of the top-rated workbenches on the market. First, we’ll give you some tips to keep in mind when making your decision. 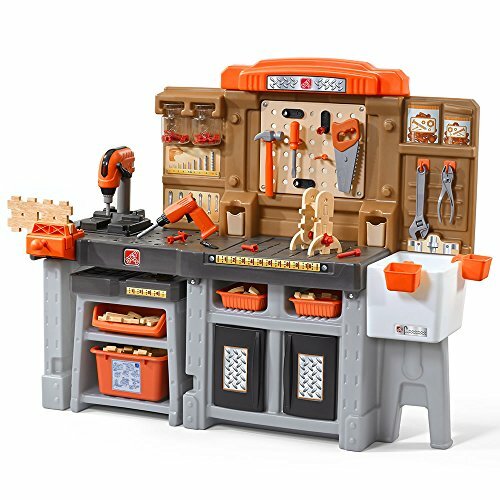 Use the links above to check the latest prices or read our in-depth kids workbench reviews below. Finding the right workbench for your kid can be tough with how many options are available. Maybe you’re looking for something more compact to fit in your limited space. 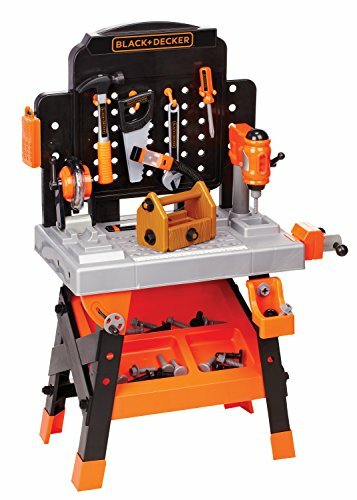 Or it could be that you want a really realistic workbench for your little construction worker. When searching for just the right toy, there are certain factors to take into consideration and ensure you pick something that will grow with your child. Nothing gives a parent more anxiety than a toy with a million pieces. Dark rooms with stray Lego bricks and toys cluttering the floor probably plague your dreams. As scary as the word “pieces” may be to parents, there’s a way to alleviate that fear. Look to see whether or not there’s a storage spot for the pieces that come with the workbench. Workbenches sometimes come with space to hang up the tools. Others may have bins that attach where you can put the other smaller pieces, like screws and bolts. This might be the key to save your sanity during clean up time. Some workbenches are more classic in style and come with just the bare bones and no extra sounds or features. Others are more hi-tech, with sounds, vibrations, and other sensorial amenities. If noisy toys aren’t your thing, it may be worth checking if it comes with volume control or different intensity settings. If you want, you can opt to “accidentally” leave the batteries out of the toy and tell your child it’s only pretend noise. We won’t tell if you won’t. When toy shopping for any child, the first thing to ask yourself is whether it’s appropriate for your child’s age and maturity level. There are several different items to check off your list for this. 4. Does It Come with Small Pieces? If you’re looking for a workbench for a child under the age of 3, look for large pieces with smooth edges. 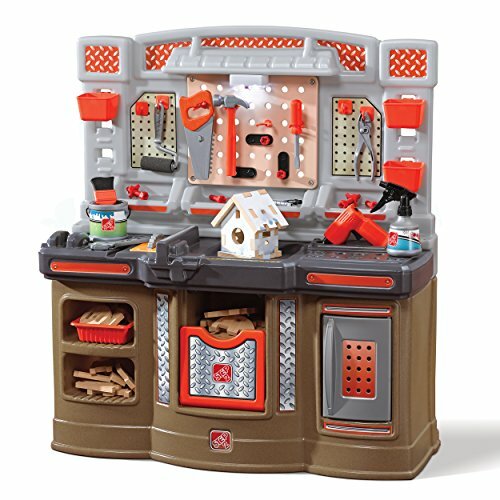 A lot of toy workbenches are geared more toward kids older than 3 years. This is because they include pieces which could be considered a choking hazard due to their size and shape. When shopping, use your judgment to gauge where your child is at developmentally, as well as their age. This will help you decide whether or not a particular workbench is the right one for your child. If you’re worried about this, there are plenty of other options out there that are still fun and educational for even the youngest of toddlers. If you aren’t sure what would qualify as a choking hazard, check out this video from the Children’s Hospital of Los Angeles. 5. Will My Child Easily Figure This Out? Just like when thinking about small pieces, gauging the level of difficulty is important to make sure you’re choosing the right workbench. You’ll need to cater to your child’s specific needs, depending on where they’re at on the scale of development. Big pieces that aren’t considered a choking hazard. 6. How Much Space Will You Need? Another important thing to keep in mind is the size of the toy. If you live in a small apartment or house, a full-sized workbench may take up too much floor space. Luckily, plenty of products are available that are compact without losing any play value. In our reviews below, you’ll find a range of sizes. There are big, sophisticated workbenches that several children can enjoy at once, all the way down to a tabletop workbench. We’ve even included a toolkit, for portable fun wherever you go. Now that we’ve gone over the ins and outs of making a decision, it’s time to choose which workbench will best fit your child’s needs. 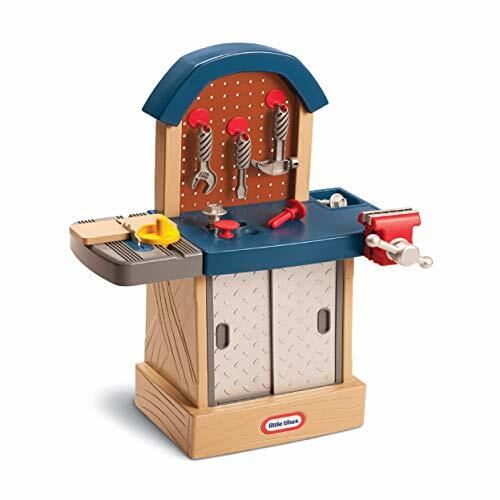 Check out our reviews below to see some of our favorite workbenches for kids. Whether you’re looking for classic or hi-tech, compact or life-size, we’ve put together a variety of options for you. The Master Workbench by Hape is unique because it has an adjustable height option so it can grow with your child. It also comes with storage space underneath the bench to store all 32 pieces that come with this set. Included in those pieces are several different gears that can be twisted into the pegboard —a great tool for teaching cause and effect. This set is recommended for children ages 3 years and up. Looks just like a grownup workbench. Adjustable height for long-term use. 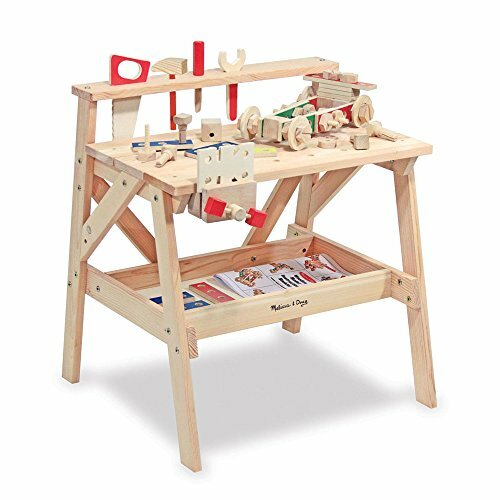 This workbench by Melissa & Doug comes in a timeless design, along with tools and other pieces that work together. This particular bench is great for kids who like to use their hands and build things. It comes with a step-by-step guide for six projects and a storage compartment underneath to make clean-up fast and easy. This bench is a great option for families that take a natural approach to toys. It’s made of high-quality wood to ensure stability and safety for the child using it. For ages 3 to 6 years. Made of high-quality materials for safety. 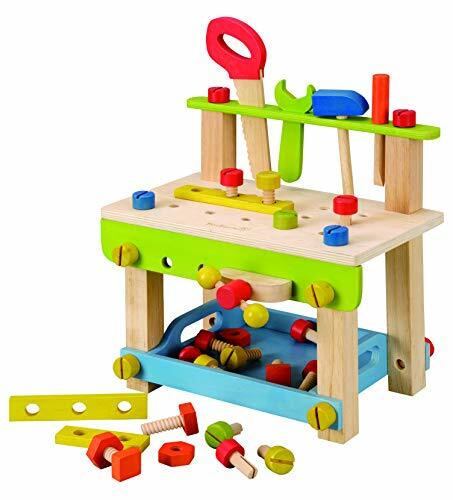 Recommended for ages 3 and up, this workbench is good for kids who like sensorial toys. The Black+Decker Junior Power workbench workshop comes with 75 different tools and accessories. It also provides realistic drilling sounds with its battery-operated power drill. Each tool is also made to look identical to real tools that you might see in an adult’s workshop. This workbench comes with storage space underneath the work area, so those 75 separate pieces don’t sound as intimidating as they did initially. Aside from the encouragement of pretend play and motor skills, this particular set is also great for teaching kids about safety. Same brand as mom and dad’s tools. Equipped with realistic lights and sounds. Only comes with one project. While most workbenches for kids are geared toward children ages 3 and older, this Little Tikes workshop is recommended for ages 2 and up. It comes with 11 accessories and a sliding door underneath, as well as a pegboard and hooks for optimal storage. 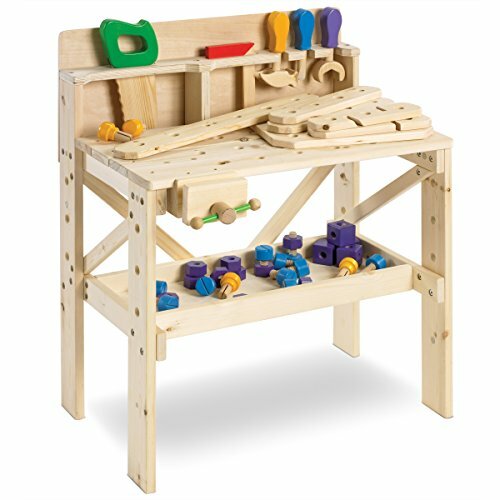 The complexity of this workbench isn’t very high, which is great for children who are just beginning to enjoy pretend play. It comes with a hammer and nails that can be pounded into a provided hole, which makes great hand-eye coordination practice. Can be used inside the house or out in the yard. Sliding doors to hide storage space. Caters to children under the age of 3. Doesn’t come with anything to cut with the saw. 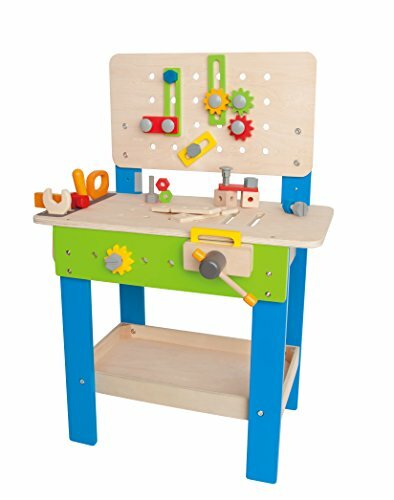 This toy workbench and accessories are made of high-quality wood with non-toxic materials and is compact enough to fit in a closet. While this particular workbench has a classic design, it still provides plenty of interactive components. There are holes drilled throughout the bench that the child can use the hammer and nails to fill them, along with a working vice. This bench provides children the opportunity to refine their hand-eye coordination, along with their fine motor skills. There’s some assembly required, but it can be put together with a few household tools. Suitable for children aged 3 and over. Wooden design with non-toxic materials. Some pre-drilled holes need more drilling to assemble. The Step2 Big Builders Pro Workshop comes with 45 pieces, including a foam birdhouse kit that changes color when you “paint” it with water. It also comes with a built-in table saw for the most creative of projects. This is a bigger workbench, so it may not be optimal for families with limited space. However, its size makes it a great toy for more than one child to play with at the same time. There’s also plenty of storage space underneath to keep all the pieces. For ages 3 and over. Comes with a birdhouse kit to build. Good for parents of multiples. Assembly is time consuming and instructions are pictures only. For families that aren’t lucky enough to have a ton of square footage in their home, the EverEarth toddler workbench is optimal. This workbench can easily fit on a shelf. It’s also made of eco-friendly wood and is toxin free to ensure your little one is playing at their safest. 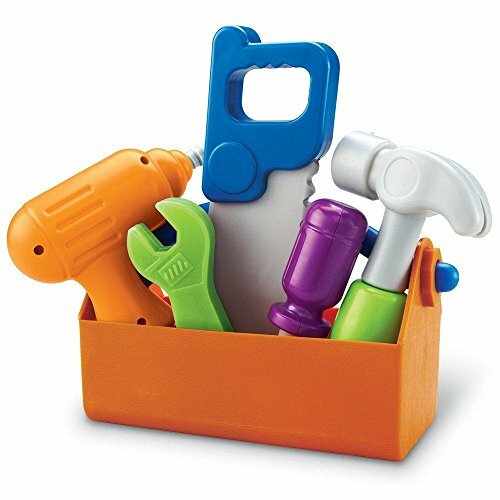 This particular set comes with five different tools as well as wooden nails, screws, and other accessories. It does come with small pieces so it’s recommended for children ages 3 and above. Great for small spaces (can be stored on a shelf). Materials are eco-friendly and FSC certified. Wood is stained with non-toxic, water-based paint. Older children may find it too small at just over 2 feet high. The Step2 Pro Play workshop is the big kahuna. Although at the top end of the price range, it comes with the most accessories, and it’s huge! It has a 76-piece accessory set as well as foam projects for little ones to put together. The Pro Play workshop provides children with a variety of activities while playing with this set. It also comes with a utility sink, pull-out utility bench, and plenty of storage space to store all the accessories. This workbench is optimal for children ages 3 and up. Comes with several project ideas. Plenty of interactive properties, including a working vice. 9. Learning Resources New Sprouts Fix It! For parents looking for something simple and inexpensive for their toddler, the Learning Resources New Sprouts Fix It kit is a good fit. It comes with five tools and a little carrying caddy to hold them in. The drill included makes a noise when you squeeze the handle. Batteries aren’t needed due to the noise coming from a spring inside the drill. This particular set is great for little ones ages 2 and up. It serves as an introduction into the world of pretend play by providing a few tools and leaving the rest to your child’s imagination. Great for kids from 2 years old. Tools are the perfect size for little hands. Doesn’t actually come with a workbench, just tools. With all of the options out there, it’s hard to decide which one is right for your family. As a parent, you want to make sure your child’s developmental needs are being met. This makes finding toys that help with gross and fine motor skills as well as pretend play hard to come by. My favorite is the Hape Master Workbench. You can be sure that this bench will grow with your child, from toddlerhood to early elementary school, thanks to its height adjustability. Practicality is a hot topic among parents since the decluttering trend arrived, and this particular workbench is the most practical that I’ve found. Do you have a budding master builder in your life? Have you purchased any of these workbenches for kids? If so, which did you choose and why? Let us know your experiences below.